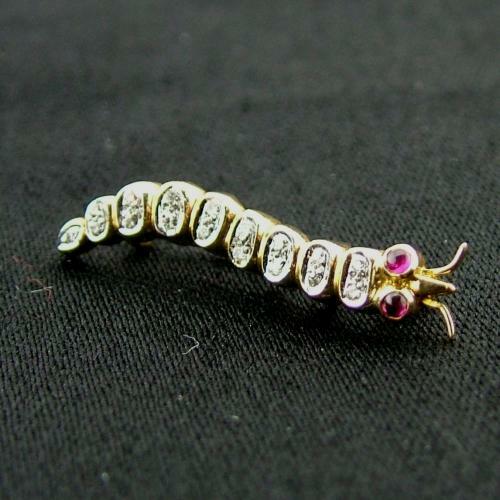 This exquisite gold caterpillar badge is just 25mm in length and has ruby/amethyst gemstone eyes. The basic design is the same as those awarded to airman whose lives had been saved by one of the Irvin Air Chute Company's parachutes. However this example is a 'one-off', commissioned and manufactured for a member of staff at the company. It is made from purer 14 carat gold (rather than the usual 9) and is set with 9 diamonds in line along its back. The pin is hallmarked and the diamonds have been tested as genuine. A superb piece and almost certainly unique. Stock code M211ICP.